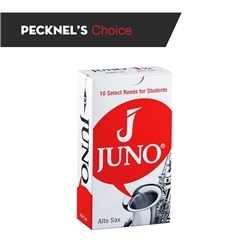 Everyone from students to music teachers love the Juno reeds. They're designed to help find early success by making it easier to play the instrument from the lowest to the highest note. Juno reeds are perfect for beginners: when you sound better, playing is more fun. And when you're having fun, you keep playing. Juno reeds are specially made with student players in mind from select cane grown on the Mediterranean basin. The reeds are given a special cut that's extra responsive for students, so they can improve faster. Once the reeds are precisely cut, each one is sealed in its own humidity balanced Flow Pack, so when a Juno reed is taken out of the box, it feels and sounds as fresh as the day it was made. It's easy to find a Juno reed that feels good to play - and helps you sound good too.